Please refer to our stock # 601 when inquiring. 16,5" ( 43 cm ) pretty fashion doll with lovely pale bisque swivel head on kid-edged bisque shoulder plate of pale quality and gentle face expression . 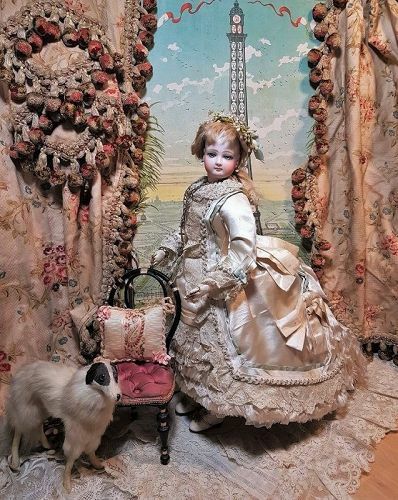 She has light almond shaped pale blue glass enamel eyes like the lovely portrait poupees by Jumeau , dark eyeliner and fine painted long lashes . Her condition is generally excellent , bisque are free of damage , chip , hairline or repair !! A luxury poupee model with distinctive and elegant presence !!! Please note that this offer included only my outstanding fashion doll , all other my decoration for your inspiration . About the pretty salon chair , you can find it in another offer in my shop !! Thank you for your interest on my Doll - Shop and let me know if you have any question !! Layaway are always welcome , please ask me about ! !